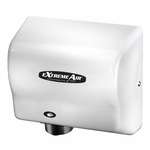 Home > Bathroom Accessories > Sanitary Napkin/Tampon Disposals > Bobrick B254 Sanitary Napkin Disposal 1.2-Gal. Satin-finish stainless steel. Door has tumbler lock. Self-closing panel covers disposal opening. Removable, leak-proof 1.2-gal (4.6-L) plastic receptacle.